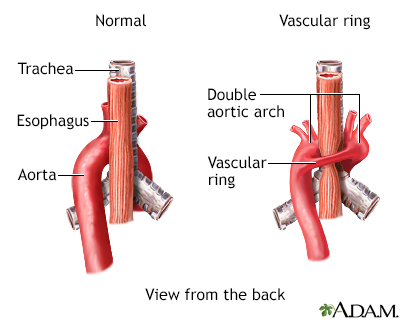 The aortic arch is the top part of the main artery carrying blood away from the heart. Aortic arch syndrome refers to a group of signs and symptoms associated with structural problems in the arteries that branch off the aortic arch. Aortic arch syndrome problems can be due to trauma, blood clots, or malformations that develop before birth. These defects result in abnormal blood flow to the head, neck, or arms. An inflammatory disease called Takayasu syndrome may result in narrowing (stenosis) of the vessels of the aortic arch. This typically occurs in women and girls. This disease is seen more often in people of Asian descent. Surgery is most often needed to treat the underlying cause of aortic arch syndrome. Braverman AC, Schermerhorn M. Diseases of the aorta. In: Zipes DP, Libby P, Bonow RO, Mann DL, Tomaselli GF, Braunwald E, eds. Braunwald's Heart Disease: A Textbook of Cardiovascular Medicine. 11th ed. Philadelphia, PA: Elsevier Saunders; 2018:chap 63.